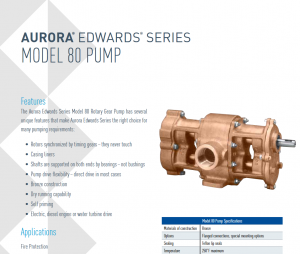 Edwards High Performance Pumps have consistently proven their reliability, performance, and innovation in countless locations across the United States since 1926. The Aurora Edwards Series Pump from Pentair is a positive-displacement pump built specifically for meeting and exceeding the demanding requirements of foam concentrate and water mist fire protection systems. UL Listed, FM Approved, NFPA 20 Compliant. Dry running capability, all bronze construction. UL/FM Foam and Water Mist Packages. Petro-Chemical, Aircraft Hangar, Water Mist, Mobile Apparatus Foam Injection & transfer pump systems. All pumps undergo rigorous flow tests to ensure quality and durability. Need replacement pumps or parts? We are your source! Whether you’re in need of fire-fighting foam concentrate, water mist pumps, or specific equipment for stationary or mobile applications, Edwards blows away the competition. These bronze pumps include optional flanged connections as well as special mounting options, Teflon lip seals, discharge pressures of 0-300 psi, and electric, diesel, or water turbine pump drives. If you’d like to learn even more about each of these Edwards rotary gear pumps, we have dimensions for both diesel and electric drives, flow curves, O&M, repair parts index, and a sales brochure for each on our downloads page. To discuss these pumps with us, or to order, call us today at 302-652-4720 and we’ll be happy to help! Posted in Aurora and tagged edwards, edwards pumps, pentair, rotary gear pump, UL/FM on May 8, 2018 by admin. Fire Training with Steven Brown & Associates: Join Us! Which Fire Extinguisher is Right for You? What Can Steven Brown Do for You? © Steven Brown & Associates, all rights reserved. Web design by Sharp Innovations, inc.